Recipe Yield: Total time: 40 minutes | Serves 6 to 10. Step 1 Roast the peppers: Place the peppers on a rack over a stove-top burner and roast, turning constantly, until charred on all sides, 5 to 7 minutes. Place the peppers in a bowl and cover with plastic wrap. Set aside for a few minutes (this will give the peppers time to steam, so they peel more easily), then remove and peel each one, rubbing off the charred skin and discarding the stems (remove the seeds if desired). Do not rinse. Step 2 Place the peppers in a blender, along with the onion, garlic, parsley, milk and crema and puree well to form a sauce. Set aside. Step 3In a pot, warm the butter until it is melted. Add the poblano sauce and bring to a simmer. Reduce the heat to maintain a gentle simmer and cook for 10 minutes to marry the flavors, stirring occasionally. Step 4Meanwhile, cook the pasta. In a large pot of boiling liberally salted water, add the pasta with the bay leaves and cook the pasta a minute or two less than the packaging instructs. Step 5Drain the pasta and add to the pot with the poblano sauce, discarding the bay leaves. Stir or toss the pasta to coat with the sauce. Remove from heat and add a drizzle of olive oil and a good sprinkling of grated cheese, then toss well. Top with more grated cheese and serve immediately. In Recipes-list.com we have selected the most viewed recipes from category - Main courses . Enjoy the best recipes specially selected for you! 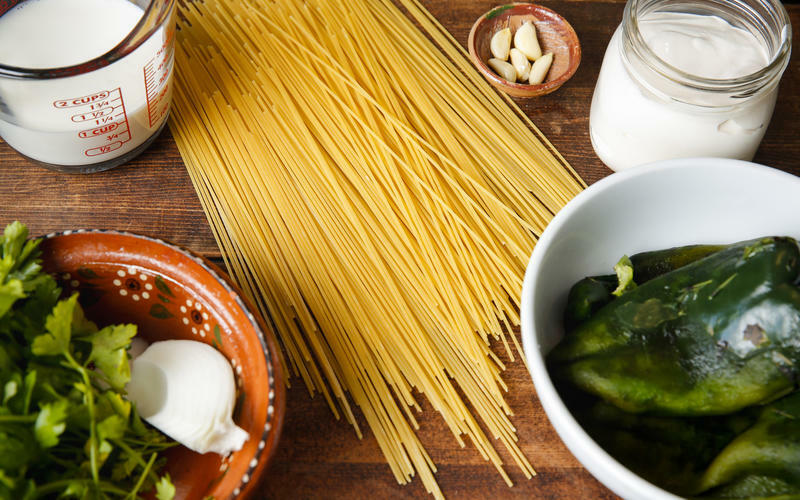 Poblano spaghetti is the right choice that will satisfy all your claims.